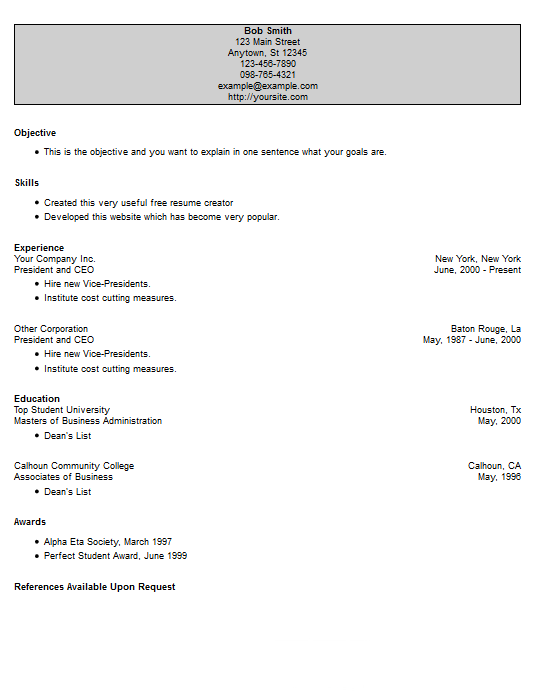 An awesome resume template when you need something that looks different than everything else out there in the job market. Make your resume distinctive compared to everyone else's, you don't have to be part of the status quo. This style is not an off-the-wall design, but it does show some creativity on your part and the desire to be dissimilar to your competitors. The header located at the top can be filled in with the color of your choosing. The surrounding border will be the same color as the words on the page so balance the colors of the words, the border and the header. The remaining sections are relatively standard as compared to our other designs, but the pop of color at the top can make the reader take notice of what you have to say. If you are in the process of changing careers this awesome template could be a nice change from the ordinary, a fresh start. When writing this new resume put a spotlight on the abilities you possess that are most closely related to your new career. If you have gone to school recently to acquire the knowledge needed for this new career don't completely discount your past jobs and the training you have under your belt. We have many articles about changing your career, about job success and even filling out job applications. If you are interested in getting this template you are welcome to have it for no charge, make a resume with our creator and export it from there. You can pick this one or choose from many others that you may find to be more suitable for your job application.